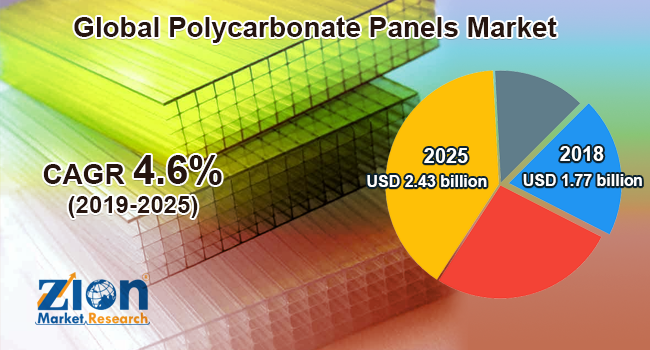 Global polycarbonate panels market expected to reach USD 2.43 billion by 2025, at a CAGR of 4.6% between 2019 and 2025. The global polycarbonate panels market is expected to grow rapidly in the years ahead owing to the rising product application in several end-user industries, such as automotive, construction, and electronics. The report covers forecast and an analysis of the polycarbonate panels market on a global and regional level. The study provides historical data from 2016 to 2018 along with a forecast from 2019 to 2025 based on both volume (Kilotons) and revenue (USD Billion). The complete study covers the key drivers and restraints for the polycarbonate panels market along with the market impact within the forecast period. Furthermore, the study also includes the opportunities accessible within the polycarbonate panels market on a global level. The study also includes the market share of the key participant’s operating in the polycarbonate panels market across the globe. Besides, report covers the strategic development together with acquisitions & mergers, agreements, partnerships, collaborations, and joint ventures, and regional growth of the key players within the market on a regional basis. The study provides a crucial view of the polycarbonate panels market by segmenting the market based on type, application, and region. All the segments have been analyzed based on present and future trends and the market is estimated from 2019 to 2025. By type, the global polycarbonate panels market includes multi-wall panels, corrugated panels, and solid panels. By application, this global market includes building and construction, automotive, electrical and electronics, medical, and others. The regional segment includes Europe, North America, Latin America, Asia Pacific, and the Middle East and Africa. The regions are further divided into major countries, such as the U.S., UK, Germany, Canada, France, China, Japan, Brazil, GCC Countries, and South Africa, among others. Some key players of the global polycarbonate panels market are SABIC, Palram Industries, Covestro, Plazit, UG-Plast, Gallina, Polygal, Brett Martin, Koscon Industrial, SafPlast, Carboglass, Arla Plast AB, DS Smith, IsikPlastik, Aoci Decoration Material, Gi Plast, JiasidaSunsheet, and Quinn, among others.